As you probably know by now, Jelastic is the only PaaS in the known Universe that has automated vertical scaling of your environments. 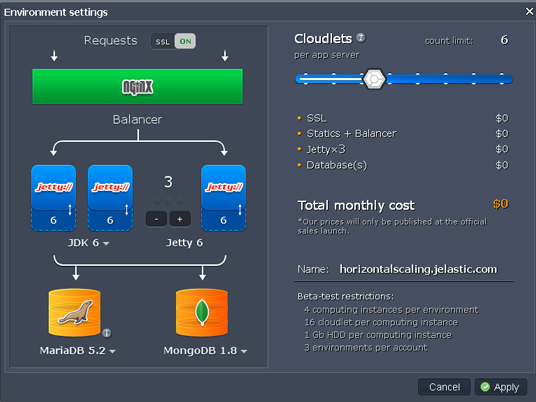 Now in addition to this, Jelastic lets you scale your applications horizontally by changing the number of application servers. At the moment you can change the number of web server instances between 1 and 4, and this is a manual operation in Jelastic dashboard. Besides adding or removing web server instances, you can also turn on/off https (SSL) protocol, add/remove databases. When multiple instances are used, load is distributed evenly between them.